Flashlight uses the switch at the taicap for on/off function . E-switch navigates through modes , with a short press (Turbo – Hogh – Medium – Low – Moonlight Low) . Long press activates tactical Strobe (and another long press if you are in Strobe activates SOS) . Also flashlight has mode memory . Moonlight mode is really low . 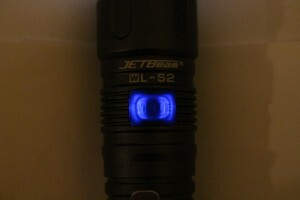 Led in lower modes uses PWM , but the frequency is so high that it can’t be seen ( even by “sensitive” eyes ). Would you like one ? Subscribed, waiting for the updates and coupon code (if there’s one). Can you compare color temperature of Jetbeam and Thrunite. Is there any PWM in modes? Can you compare color temperature of Jetbeam and Thrunite. Is there any PWM in modes?